Lost Word of JeNny (ロストワード・オブ・ジェニー, Lost Word of JeNny? 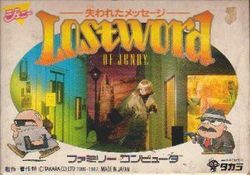 "Lost Word of Jenny") is a map-based action game developed and published by Takara for the Famicom in 1987. The player must evade dogs, criminals, and other enemies as they explore a monster's house, a church yard, NASA, and even a store. As opposed to the overhead view employed by the map screen, the actual stages of the game are played in a side scrolling view. Lost Word is based around the popular-in-Japan Jenny doll. Jenny is a 10½ inch fashion doll produced by Takara since 1982. The doll was originally known as the Takara Barbie, but became "Jenny" in 1986 after Takara ended their licensing agreement with Mattel. This page was last edited on 3 June 2009, at 19:41.